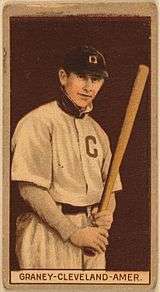 John Gladstone Graney (June 10, 1886 – April 20, 1978) was a Canadian left fielder in Major League Baseball who played his entire career with the Cleveland Indians. Following his playing days, Graney became a baseball radio broadcaster, providing play-by-play, for the Indians in 1932–53. Graney was inducted into the Cleveland Indians Distinguished Hall of Fame for non-uniformed personnel on August 11, 2012, prior to a game at Progressive Field. On June 26, 1916, the Cleveland Indians used numbers on their uniforms on an experimental basis in a home game against the White Sox. The numbers, which were worn on the players' uniform sleeves, corresponded with information in the scorecards. Jack Graney was the first player in Major League Baseball history to appear in a regular season game with a number on his uniform and, two seasons before, was the first batter to face Babe Ruth in a Major League Baseball game on Saturday, July 11, 1914. After retiring from playing, Graney became a play-by-play broadcaster for the team, thus being the first former Major League Baseball player to become a radio broadcaster in the United States. He died at age 91 in Louisiana, Missouri on Thursday, April 20, 1978. He was inducted into the Canadian Baseball Hall of Fame in 1984, its second year of operation. In 1987 the Canadian Baseball Hall of Fame instituted an award in the name of Jack Graney, presented periodically to journalists deemed to have made notable contributions to promoting baseball within Canada in their lifetime. ↑ "Jack Graney". The Blade. Toledo, Ohio. April 21, 1978. p. 9.